An Aritaum store opened up in my city recently and so I finally have an official retailer to get mid to high-end Korean cosmetics from! My wallet weeps at this news. I wasn't really looking for a cleanser, since I'm quite happy with Skinfood Egg White Pore Form that I use in my morning skin routine. But I bought the Sulwhasoo Signature Kit, which comes with small versions of their "Signature" items as well as full versions of the Sulwhasoo First Care Activating Serum EX (EX is the renewed version of the original Sulwhasoo First Care Activating Serum) and the Sulwhasoo Concentrated Ginseng Renewing Cream. 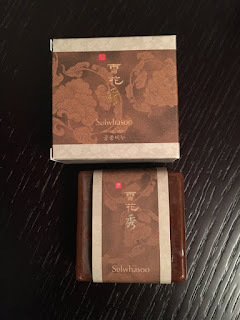 I originally just wanted to buy the Sulwhasoo Ginseng Renewing Cream, but of course I got sucked into buying a set that has 6 other things I can try out instead! I'll be doing reviews for all of these as I go along. Efficacy is optimized by harmonizing ingredients using Korean medicinal herbs: The harmony of Korean herbal medicinal ingredients, including Korean Red Ginseng, Small Solomon’s Seal, Chinese Peony, and Adhesive Rehmannia, leaves your skin clean and moist. 40 days of dedication provides special nourishment for your skin: Herbal Soap is made with a special 40-day aging process, giving you rich and nourishing bubbles that spread smoothly and help nurture youthful and clear skin. Revitalize your skin with deep cleansing and rich moisture: After cleansing, your skin will feel smooth, moist and relaxed. This is the first time I've used a facial cleanser in bar soap form. It's a bit inconvenient because I can't put it in the shower since the water would waste all the soap away. They have a sticker at the bottom to prevent the bar of soap from sticking to whatever it's on, which is a nice touch. 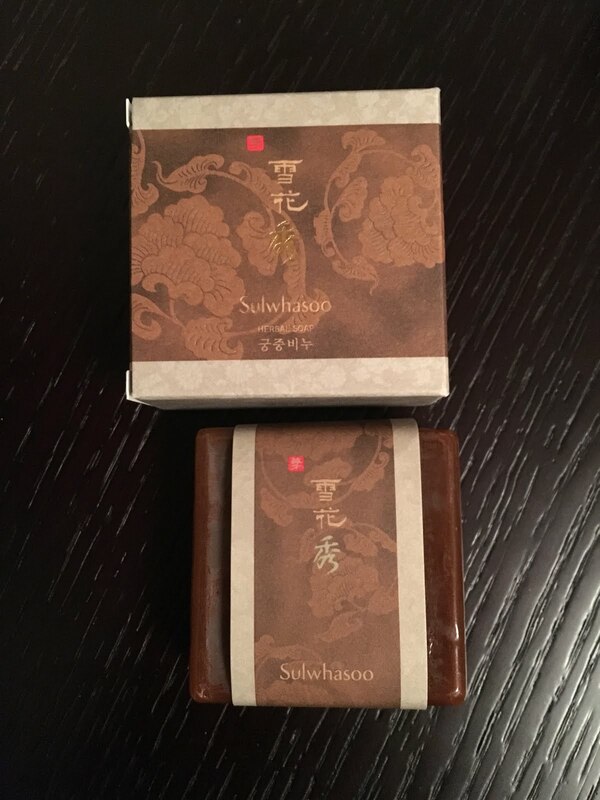 Sulwhasoo claims the use of Korean medicinal herbs leaves my skin clean and moist. I'm not sure if I can agree wholeheartedly. You know sometimes when you cleanse your face in super dry weather? Your face feels super dry and you feel the need to put moisturizer on it ASAP. Well, that's how it felt washing my face with this herbal soap. After washing my face, my face feels super dry, as if this soap just stripped all of its moisture away. It felt like this herbal soap left my face absolutely bare. Objectively, though, to be fair, my skin did not peel. Also, though my face feels clean (since it is stripped bare and dry), I'm not sure if this herbal soap really cleaned my face well. I've tried using this soap with and without my Clarisonic Mia 2. Within a week, I started having 2-3 clogged pores on the side of my face. I thought nothing of it, but it started to increase. They never worsened to become pimples but I was worried. So I switched back to using Skinfood Egg White Pore Form and within 2 days those clogged pores were gone. Finally, because this is a solid bar of soap, it doesn't lather well, especially if you're using Clarisonic or some other device. It also takes time to create a sufficient lather, which is a problem when you're in a rush to get to work in the morning! Price-wise, it's probably one of the cheaper products from Sulwhasoo. 40 USD for 100g x 2 bars of soap but a bar lasts forever. I've been using mine since the beginning of July, and I don't think I'm even halfway yet, and mine is only 75g! But from my experience, this just doesn't work very well for me, so I won't be buying a full sized version. Quality: 3/5 because I feel it doesn't leave my face with any moisture and I got clogged pores within a week of using it.